Adam made me this cutting board. There is something so much more intrinsically beautiful in a gift that is made versus bought. He’s a little protective of it, though, re-sanding the surface every now and then. I’ve even been gently reproached for allowing strawberry hulls to sit too long on its surface. There is symbolism in this cutting board, too. In the early years of our marriage my husband was a full-time carpenter, a surprisingly lucrative job for a twenty-something in a ski-town. “Building America,” he would say with a wink. He loved the work. The life-style. However, with the arrival our first child he felt it was time to move up the ranks, to trade in the hammer and tool belt for collared shirts and client meetings. Management. He had arrived. Life is full of irony. As it turns out, he quite liked that old hammer and tool belt. So much so that he’s decided its time to take a leap, to set aside the nine-to-five for a while and test out furniture making full-time. I’ll be sure to share more of his work going forward. It’s beautiful stuff. This change coincides with another, perhaps even more important. In the last year-and-a-half since Cecil was born we have become increasingly aware of the distance that separates us from our kinfolk, the sweet people who love us and our son the most. As we’ve talked, and talked, and talked some more about this decision, it has become abundantly clear that the time is now. Everything all at once. At the end of July, with quiet enthusiasm and measured certainty, we will move back to the Oklahoma hills where Adam was born. This is one of my favorite vegetarian/vegan dinners. It just feels good to get full on a bunch of colorful vegetables. You could easily substitute any number of different veggies: asparagus, green beans, a handful of spinach, etc. If cauliflower “rice” sounds too fringe/new-age-hippie I completely understand, sometimes I’m not feeling it either, so I just substitute brown rice. Or serve both for more bulk and a little grain. Pulse cauliflower florets in food processor until they resemble the texture of rice (see pic above). Heat coconut oil in a medium sized skillet over medium-low heat, add onion and garlic and saute until softened, approximately 3-5 minutes. Stir in the cauliflower “rice”, a pinch of salt and veggie broth. Partially cover the pan and simmer/steam 5 minutes until broth has evaporated and the cauliflower is tender but still toothsome. Keep warm. While the “rice” cooks, make the curry. In a large skillet or wok, heat the remaining coconut oil over medium to medium-high heat. Add the garlic, ginger, curry paste and brown sugar and cook for 1 minute, stirring to incorporate the ingredients. Add the veggie slices: onion, carrot, broccoli and red bell pepper. Stir-fry 2-4 minutes until tender-crisp and just beginning to brown on the edges. Decrease the heat to low and add the coconut milk, stirring to loosen any browned bits. Allow curry to simmer gently and thicken for 2 minutes. Taste and adjust seasoning as necessary. To serve, spoon veggies and sauce over cauliflower “rice”. Top with pumpkin seeds, cilantro, fresh sprouts, and a lime wedge. I was the happy recipient of two grocery bags full of homegrown tomatoes last weekend (thanks Erika!). Talk about the perfect gift. Admittedly giddy, I went through and delicately handled each shapely orb, dividing them into little groups according to ripeness and day-dreaming about all the ways I could use them up. There was one beautiful heirloom with dark burgundy and black stripes that begged to be eaten, so I sliced that one thick and ate it on the spot. The four biggest, buxom beauties were set aside with this dish in mind. I’ve been ogling the recipe at Rachel Eats for over a month, hoping to get my hands on a few particularly good tomatoes. 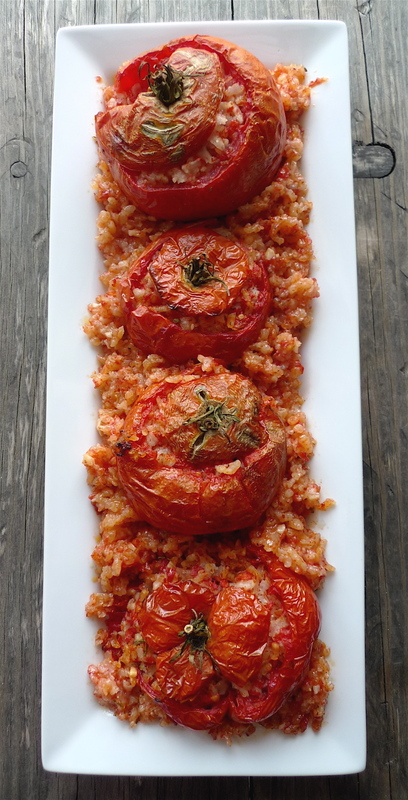 Pomodori col Riso translated is literally Tomatoes with Rice. No bells and whistles here. Much like the name, the ingredient list is a minimalist’s dream: tomatoes, rice, olive oil, salt and pepper, and a few leaves of fresh basil. I t should come as no surprise that the preparation is equally straightforward. Basically, empty the tomatoes of their pulp and juices, mix said pulp and juices with everything else, and then refill the tomatoes with the mix. Indeed, a perfect example of Italian culinary brilliance and thrift. Nothing goes to waste. I am over-simplifying the process a bit, because it is necessary to heed two other very important steps. We’ll call them “The Wait” and then “THE LONG WAIT”. You see, once you’ve got your bowl of tomato pulp, rice, oil, and seasonings – a primordial soup if I’ve ever seen one – you must allow it to sit. The rice will swell and soften, absorbing the flavors of each component. Rachel recommends at least 45 minutes. It is after this little wait that you stuff the tomatoes and then roast them in the oven. Now comes the torturous final step, or “THE LONG WAIT”, whereby you allow those hot, intoxicating and shriveled mounds to rest…for hours…at least 2-3, or even over night. In an effort to escape the aroma and avoid temptation until dinner, Cecil and I went for a long walk. The Pomodori are traditionally served at room temperature, which we noted allows all that flavor to really sing. The rice was exceptionally creamy, so much so that Adam asked in a puzzled tone what cheese I had used. The answer was, of course, none in the least. Now, I must confess, I went a little rogue in my choice of fresh herbs. I had a nice bunch of fresh thyme but no basil on hand and it seemed frivolous to run out for just basil. I reasoned that an Italian would more likely frown down upon wastefulness than swapping herbs. Besides, it is mid-September and where I live the leaves are already turning, Fall is in the air, and thyme just seemed more appropriate. We served our stuffed tomatoes along side perfectly fried, runny-yolk eggs, fondly named Nick’s Eggs in our house, after our brother-in-law. I will have to post that recipe sometime. Do pop over to Rachel’s post for her spirited and altogether charming description of the preparation process; it is a delightful read. Using a paring knife, slice off tops of tomatoes and set aside. 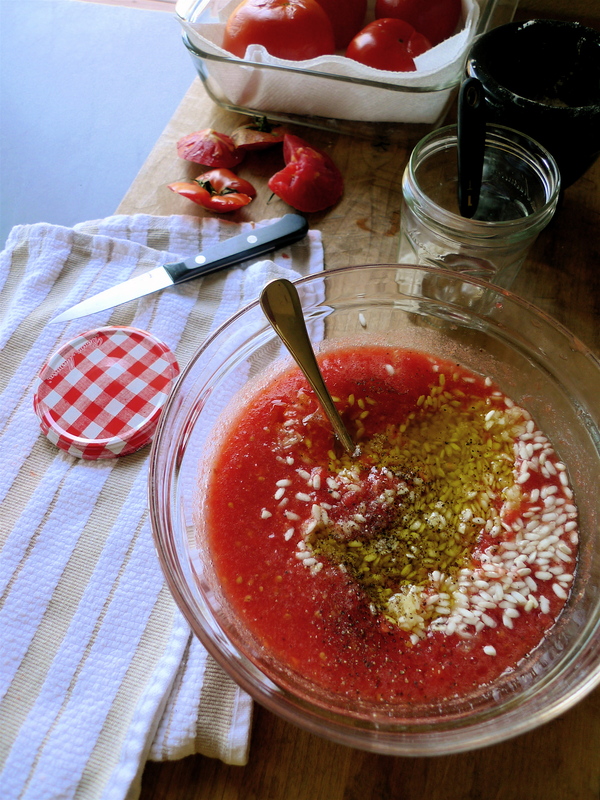 Scrape out tomato pulp, seeds and juices into a medium-sized bowl, leaving enough flesh intact to provide structure. Sprinkle interior of each scraped tomato with a little salt and then place top down over a few folded paper towels to drain. Break down the tomato pulp via a food mill, an immersion blender, or a pulse or two in the food processor. You don’t need a smooth texture; you just need to smoosh any large chunks. To the bowl of tomato pulp add the minced garlic, rice, olive oil, about 4 pinches of salt, a few generous grinds of fresh black pepper and thyme. Stir the mix, cover with a tea towel and allow to sit at room temperature for at least 45 minutes. Preheat oven to 400 degrees F. Oil a baking dish that will accommodate all of the tomatoes without being either too roomy or too snug. 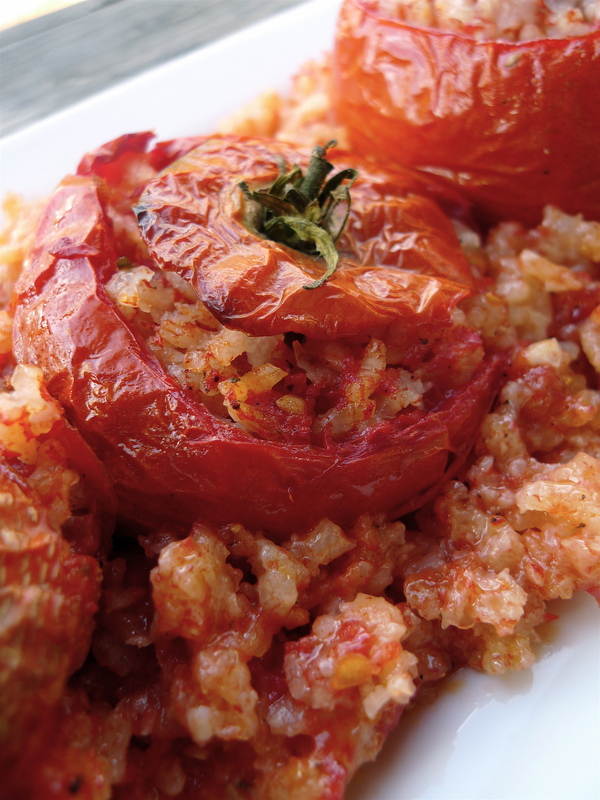 Before stuffing the tomatoes, stir the mix one more time and taste, avoiding any of the still-crunchy rice. Adjust seasoning if necessary. 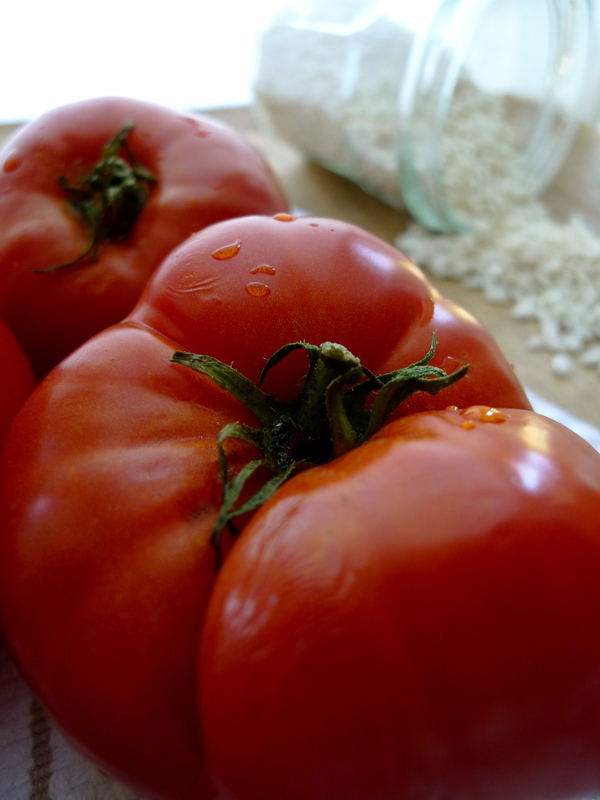 Fill tomato shells 3/4 full with tomato pulp and rice mixture and replace tomato tops. Place tomatoes in the oiled baking dish. Dollop any leftover stuffing around the tomatoes in the bottom of the dish. Roast for 45 minutes, until the rice is tender. Allow to cool 2-3 hours, at least. Serve at room temp. At last Spring has sprung. The snow is melting. Our daytime high is reaching the mid-fifties. We had fresh strawberries for dessert with friends the other night (thank you, Andrea!) and they were some of the best I can remember. Turns out they were $1 per pound at my grocery, too. So, I snatched up 5 pounds with this very tart in mind. I stumbled upon this recipe years ago in Martha Stewart’s Living magazine and it’s been burning a hole in my overflowing recipe to-do file ever since. Much to Adam’s annoyance, I didn’t get started until 9:00 pm last night and didn’t finish until 11:15 pm. Such working hours can put a strain on any relationship, especially when you live in a 500 SF studio apartment. Needless to say there was grumbling and growling from the general direction of our bedroom when I removed the tart from the oven, set it to cool, etc, etc. I’m happy to report that serving the tart for breakfast, no less on a ho-hum Thursday morning, smoothed things over quickly. So, my marriage is fine and the tart? Well, the tart is quite good. Labor intensive, but worth it. I will definitely make this again. I decreased the sugar content by half because I thought my berries were plenty sweet on their own and I hate when fruit desserts are ruined with too much sugar. However, next time I will use the full amount of sugar called for because this filling should be sweet, almost like jam, but with more texture. The crust is buttery and not too rich and I just feel that the full amount of sugar would have balanced things out nicely. Otherwise, I wouldn’t adjust a thing. Pulse flours, sugar, salt in food processor. Add clarified butter pieces and pulse a few times until mixture resembles coarse meal. With machine running add water until dough just comes together. Alternatively, mix flours, sugar, and salt with whisk. Cut in butter using two knives or a pastry cutter until mix resembles coarse meal (butter is the size of peas). Add water and mix with a spatula or spoon until dough just comes together. Divide dough in half, wrap each half in plastic wrap. Refrigerate until firm, about 1 hour (when I’m in a rush, I’ll freeze the dough for 10 minutes or so to speed up the process). Soak strawberries and sugar for 1 hour. Drain off liquid and discard (or keep! it makes a great simple syrup for iced tea!). Add cornstarch to berries and stir. Preheat oven to 450 degrees. Roll out half of dough on lightly floured surface to approximately 10″ in diameter, or approximately 1″ overhang. Gently lay dough in 9″ removable bottom tart pan, gently press dough into sides. Prick the bottom with a fork. Pour strawberry mixture over dough. Refrigerate to keep dough firm. Roll out second half of dough on lightly floured surface to approximately 10″ round. Remove tart from refrigerator and carefully lay the top layer of dough over the filling and press edges to seal. Using a paring knife, make decorative slits in tart top. Mix oil and water and brush the top of the dough. Sprinkle with sanding sugar. Place tart on baking sheet and bake 25 minutes. Reduce heat to 400 degrees and continue to bake an additional 30-35 minutes until top is brown and filling is bubbling. Cover with foil if to begins to brown too quickly. Remove from oven and cool completely before serving. ** If you’re not casein-free substitute real butter for the ghee or shortening. I have a new favorite blog. You should check it out. Rachel combines British wit with the charming simplicity of traditional Italian food. I love her unfussy approach. 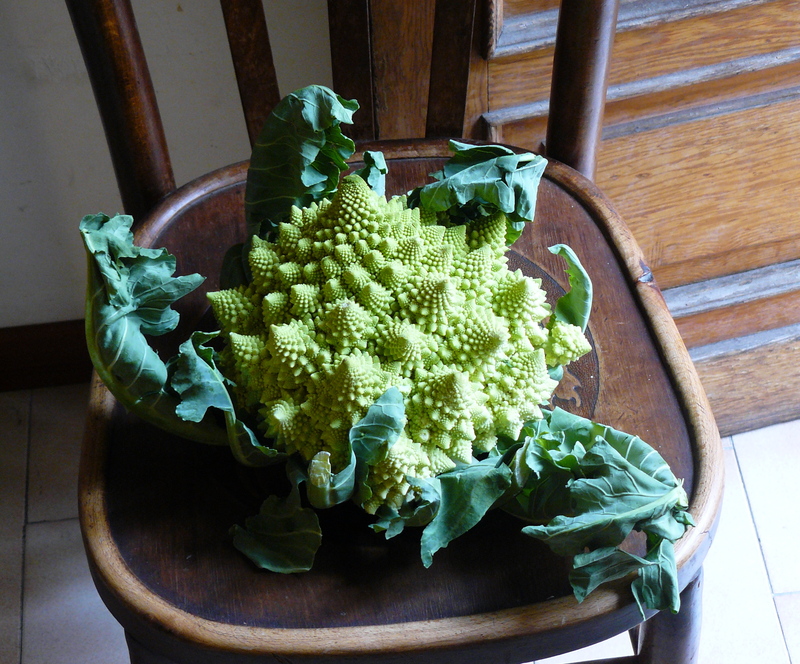 Who needs a fancy, staged backdrop when your broccoli looks like this? And your soups look like this? She has inspired quite a lot of cooking the past two weeks. Not to mention the time I’ve spent stalking her blog reading and re-reading every post. I made her Piedmontese Peppers the other night and they were one of the single most amazing food pairings I’ve ever had, beautiful to the eye and rich for being so simple, a perfectly executed combination. I had to make them again to share. Those Italians, they’ve been doing this food thing a long time. These would make a wonderful appetizer, especially served alongside good salami and olives! Half the peppers top to bottom. Using a paring knife, remove the white pith and seeds, leaving the green stem in place. Sprinkle a few slices of garlic into each pepper half. Drizzle the inside of each pepper with a bit of olive oil and then top with a dash of salt and pepper. Place 3 – 5 cherry tomato halves cut side up in each pepper. Transfer stuffed peppers to baking sheet and roast at 425 for 30 minutes. Turn oven down and continue to roast at 350 for another hour until tender and slightly charred. This is a lovely soup. You can’t beat the fact that 5 ingredients yields something so darn satisfying. It’s velvety and rich and all without an iota of dairy. I like my butternut squash soup sweeter rather than savory so I typically garnish it with a generous drizzle of agave nectar or honey and sprinkle the top with a dash of fresh-grated nutmeg. You could also serve this up as recommended in the original version with chopped chives and a side of toast. Either way, this is the perfect weeknight dinner for those first chilly nights of the season. Saute butternut squash and potato in olive oil over medium heat 3 – 5 minutes until lightly browned and beginning to soften. Add leek, salt, and pepper; saute 1 -2 minutes more. Stir in broth and bring to a boil. Reduce heat and simmer 20 minutes or until vegetables are tender. Working in batches, puree soup in blender. Taste and adjust seasoning as necessary. Serve garnished with a drizzle of agave nectar and a dash of nutmeg.